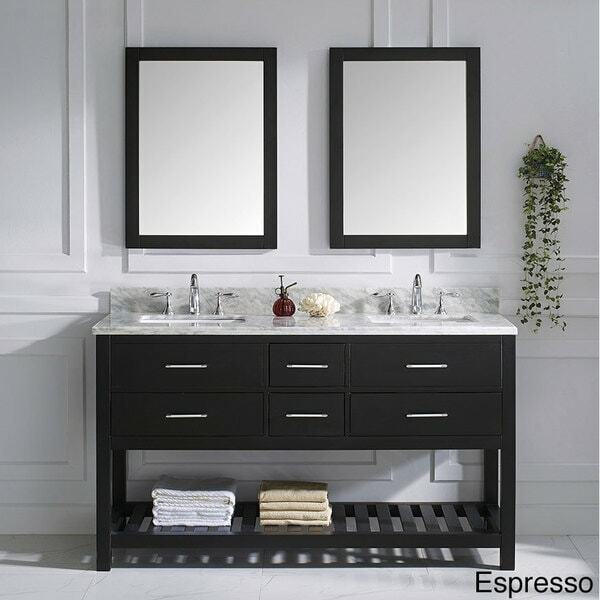 Upgrade your master or guest bathroom with this gorgeous marble-top bathroom vanity. The double sink design with twin mirrors provides ample grooming room, ideal for a his-and-hers en suite bath. Crafted of superior materials, this 60-inch bathroom vanity boasts chrome hardware finished in satin nickel to complement the Italian Carrara white marble top and satin grey oak base. Roomy drawers and an open shelf for towels help keep the space organized. "What size sinks can you use with this vanity?" Hello klester81, unfortunately this item is out of stock. We currently do not have inventory to check, and cannot guarantee the item will be restocked. Thank you for shopping with us. "Hello, is this available in other sizes?"